NASA’s Mars Reconnaissance Orbiter has revealed to scientists slender dark markings — possibly due to salty water – that advance seasonally down slopes surprisingly close to the Martian equator. “The equatorial surface region of Mars has been regarded as dry, free of liquid or frozen water, but we may need to rethink that,” said Alfred McEwen of the University of Arizona in Tucson, principal investigator for the Mars Reconnaissance Orbiter (MRO) High Resolution Imaging Science Experiment (HiRISE) camera. Tracking how these features recur each year is one example of how the longevity of NASA orbiters observing Mars is providing insight about changes on many time scales. The seasonally changing surface flows were first reported two years ago on mid-latitude southern slopes. They are finger-like features typically less than 16 feet (5 meters) wide that appear and extend down steep, rocky slopes during spring through summer, then fade in winter and return the next spring. Recently observed slopes stretch as long as 4,000 feet (1,200 meters). McEwen and co-authors reported the equatorial flows at the conference and in a paper published recently by Nature Geoscience. 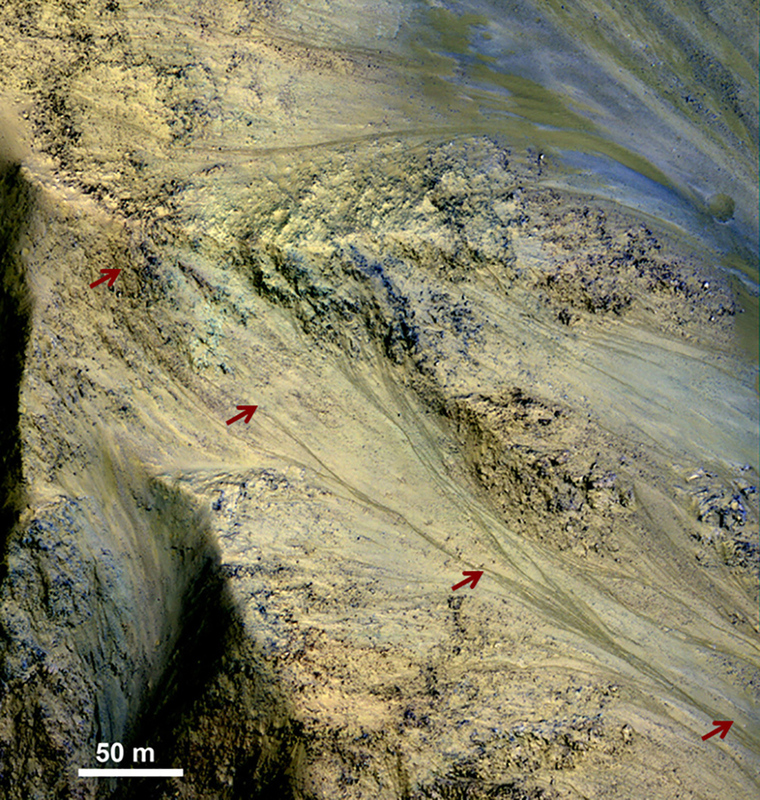 Five well-monitored sites with these markings are in Valles Marineris, the largest canyon system in the solar system. At each of these sites, the features appear on both north- and south-facing walls. On the north-facing slopes, they are active during the part of the year when those slopes get the most sunshine. The counterparts on south-facing slopes start flowing when the season shifts and more sunshine hits their side. Dissolved salts can keep water melted at temperatures when purer water freezes, and they can slow the evaporation rate so brine can flow farther. This analysis used data from the Compact Reconnaissance Imaging Spectrometer for Mars and the Context Camera on the MRO as well as the Thermal Emission Imaging System experiment on NASA’s Mars Odyssey orbiter. Water ice has been identified in another dynamic process researchers are monitoring with MRO. Impacts of small asteroids or bits of comets dig many fresh craters on Mars every year. Twenty fresh craters have exposed bright ice previously hidden beneath the surface. Five were reported in 2009. The 15 newly reported ones are distributed over a wider range of latitudes and longitudes. Mars’ modern climate becomes better known each year because of a growing set of data from a series of orbiters that have been studying Mars continually since 1997. That has been almost nine Martian years because a year on Mars is almost two years long on Earth. Earlier missions and surface landers have added insight about the dynamics of Mars’ atmosphere and its interaction with the ground. “The dust cycle is the main driver of the climate system,” said Robert Haberle of NASA’s Ames Research Center in Moffett Field, Calif.
One key question researchers want to answer is why dust storms encircle Mars in some years and not in others. These storms affect annual patterns of water vapor and carbon dioxide in the atmosphere, freezing into polar ice caps in winter and replenishing the atmosphere in spring. Identifying significant variations in annual patterns requires many Martian years of observations. The data emerging from long-term studies will help future human explorers of Mars know where to find resources such as water, how to prepare for hazards such as dust storms, and where to be extra careful about contamination with Earth microbes. Launched in 2005, Mars Reconnaissance Orbiter and its six instruments have provided more high-resolution data about the Red Planet than all other Mars orbiters combined. Data are made available for scientists worldwide to research, analyze and report their findings. For more information about NASA Mars exploration missions, visit: www.nasa.gov/mars. For more about HiRISE, visit: http://hirise.lpl.arizona.edu.